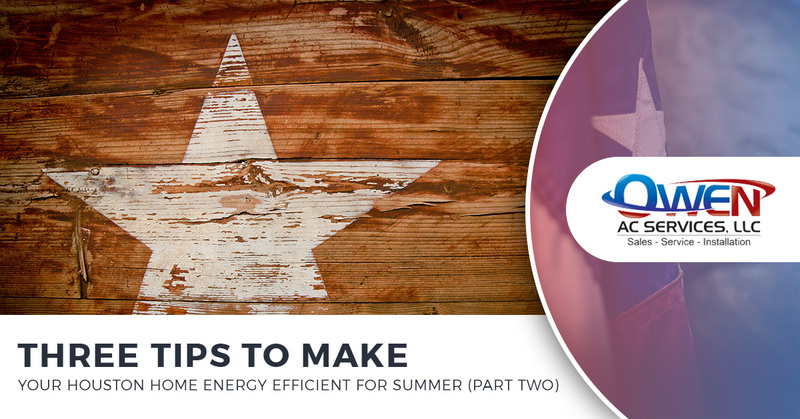 In our last post, we covered energy efficiency tips, such as optimizing your windows, controlling your thermostat, and combining cooling methods for optimal energy efficiency to better cool your home in the Houston summer heat! In today’s post, we’ll explore a couple more energy efficient things you can benefit from for a refreshing and cozy space. If you’re looking for industry-leading HVAC services in north Houston, Owen AC Services is a company brimming with skilled, experienced, and helpful professionals. For the coolest, crispest AC air this summer, give us a call! Find out more additional tips on how to keep the cool air in and save on your energy costs this summer. Your central air conditioning system needs routine maintenance for longevity and efficiency, so scheduling regular maintenance now will have it in perfect working order for summer. It’s also ideal to take care of it now when temperatures are cooler, so if there is a repair or replacement that needs to be made, you won’t be sweating in the heat of your home. To maximize your home’s cooling abilities, do not place objects around your thermostat, especially electronics that produce heat. The thermostat is sensitive and can sense the heat, which causes the thermostat to run more and for longer periods of time. Remember to keep furniture and other large objects away from the vents. If there are any obstructions, your home is not being sufficiently cooled — instead, your furniture is! Barbecues are popular in the summer for a reason — they keep the heat outside! Utilize the barbeque as much as possible this summer to avoid heating the house by turning on the stove or microwave oven. It’s also important to note that all appliances give off heat, so to better conserve the cool air and energy used, keep their usage minimal. Turn off all lights during the daytime or opt for energy-efficient lighting that runs much cooler. Even running your dishwasher and laundry units produces heat and energy, so remember to run them at full capacity and set them to run when you’re not home. Incorporate the method of daylighting as best as you can. Daylighting incorporates natural lighting through windows and skylights to help save energy. The best place to use daylighting in the summer in on north-facing windows. This light is very balanced with relatively no summer heat spikes. West and east facing windows work well in morning and evening times, but will emit a good amount of heat with the midday sun. The most obvious way to dramatically decrease your home’s energy efficiency and ability to cool your indoor space is to address any leaks or cracks that allow the air to escape. Be sure to seal all cracks and crevices where cool air gets out. Use weatherstripping or caulk around old windows and doors. Caulk – This can be used to seal cracks and larger gaps in stationary areas. Weather-stripping – This can be used in areas that are fluid, such as windows and doors. 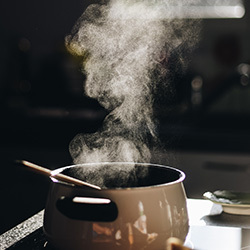 Not only does air-leakage issues contribute to poor cooling that leads to energy efficiency, but it can also cause air-quality issues with dust and dirt that can come in. During storms, water and moisture are also able to work themselves in, which can spore mold, affecting the home owner’s health and structural integrity. To keep cool air in and the elements out, be sure to address any air leakage issues! When you use all six tips, including the ones we covered today that include optimizing your HVAC system, avoiding added house heat with appliances, and keeping the cool air in — you will have the most energy efficient home that stays amazingly cool all summer long. Retreat to your home for movie marathons, TV binge-watching, and game nights — your home will be the envy of the neighborhood! Combined with the energy saving tips, having a properly functioning HVAC system is imperative for the summers in Houston. Contact us today at Owen AC Services for the finest AC repair and maintenance and new AC installations! If you’re into saving your wallet, we even have a VIP AC maintenance program! Call today!